Ceelin Plus and VitaPops Review and Giveaway! I always worry about my son’s health. I don’t want him getting sick. When he was still a baby, he would easily catch colds, cough and fever which resulted in our frequent visits to his pediatrician. To make him stronger and healthier, I give him vitamins every day. Years of using Ceelin Plus has strengthened his immune system, and as a proof of that, he was never absent from his Kinder 2 class from June 2012 to March 2013. 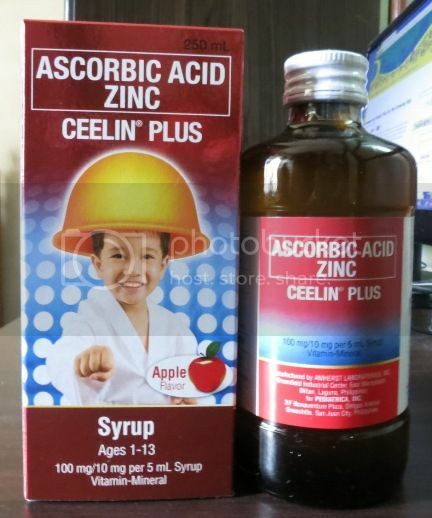 Ceelin Plus is an apple-flavored syrup with 100mg of Vitamin C and 10 mg of Zinc. Together, Vitamin C and Zinc boosts immunity and prevents stunting. 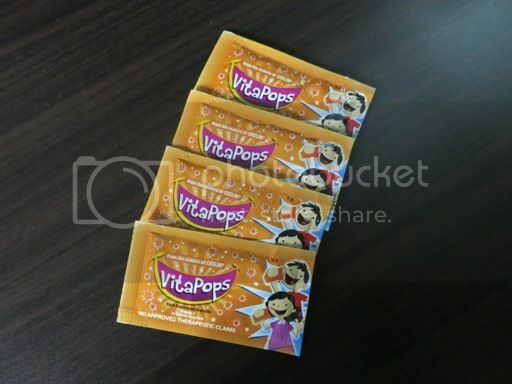 Late last year, we were given free samples of VitaPops, the first and only pop-rocks Vitamin C in the Philippines. It fizzles and pops inside the mouth, which is why my 6-year-old son likes it very much. VitaPops comes in a single-dose sachet, which makes it convenient to bring, and because it is, this is what we now bring with us when we travel. One sachet of VitaPops has 50 mg of Vitamin C which is equivalent to 5 glasses of milk or 28 pieces of calamansi or 1.5 glasses of freshly squeezed orange. It also has low sugar content, plus it can be taken on an empty stomach because it’s formulated with Sodium Ascorbate. Suffice it to say that Ceelin Plus and VitaPops are my son’s immunity boosters. He has gotten stronger and healthier because I alternately give him these two vitamins. Your kids will also have a chance to try these immunity boosters because Pensive Thoughts, in partnership with Unilab, will be giving away Php1,500 worth of Ceelin Plus and VitaPops products to one lucky winner. Open only to Philippine residents, this giveaway starts today and ends on May 14, 2013. All entries will be verified. The winner will be notified via email after the giveaway has ended. If the winner has not contacted us within 48 hours, a new winner will be drawn. Unilab will take care of delivering the prizes to the winner. This entry was posted in Blog Contest, Blog Giveaway, Ceeliin Plus, Pensive Thoughts, Product Review, UNILAB, VitaPops. Bookmark the permalink. 41 Responses to Ceelin Plus and VitaPops Review and Giveaway! I’d like to win Ceelin products because my son, daughter and nephews all use Ceelin. When it comes to vitamin C for my daughter I didn’t use anything else but Ceelin. I would like to win Ceelin Plus products because it’s my baby’s brand of Vitamin C.
i’d love to win Ceelin products because it is the only vitamins i give to my son, hopefully now that he is bigger he will be more than willing to drink it! 🙂 i will also share some to my niece + nephew! Because Ceelin Plus is the vitamins of my son and Unilab products are trusted brands that we use ever since, I also gave my son the Neosep, Biogesic, Solmux for kids and for adults we also take this, and I also use some of the Unilab beauty products like Asian Secrets, Carb Trim, Celeteque.. And I would like to try the VitaPops for my son too..I know he’s going to love it also & enjoy taking this as his vitamins.. I would like to win because my son is a Ceelin Plus kid! I’d like to win Ceelin plus products because all my kids use them. That would mean savings for me and my family. We’ve been Ceelin plus users for the longest time. Plus, my daughter wants to try out Vitapops too. I would like to win because my cousin is a Ceelin Plus user! I would like to win this because Ceelin is my trusted brand when it comes to my son’s health. Lately, he also likes Vitapops because of its uniqueness. I really want to win this because I believe that Ceelin’s Plus is a trusted brand and based from experience my 4 year old nephew used to be a sickly child and he always gets colds and cough easily. But after taking Ceelin Plus he became more active and he doesn’t get sick easily anymore. I am joining because this summer, I feel like my little siblings need more protection. I am already a grown girl but I also need defense but most importantly, their health means so much more to me. My kids needs a lot of supply of Vitamin C, they are very prone to cough and colds! We have been using this for years. its good to know that i can win some for my family!!! I want to win because I am still searching for the right vitamin for my two kiddos who are in nursery and kinder this coming school year. what I used is a multi vitamin with appetite booster but my pedia advice me to give them vit. C for their immune system. I want to win this because my son has very weak immune system and I am still in search of the perfect Vit C that would shield him from viruses and sickness around him. With the change in weather, I’d love to have my kids protected with Vitamin C.
I am a breastfeeding mom and believe that health is very important for growing up. My baby is now 17months old and since I switched to ceelin plus he rarely get sick. I used to belueve that vitamins sold in the market are all the same. Only ceelin proved me wrong! I want to win the price to save my budget from buying this wondedul products and to contiue niurish my son’s good health. my kids are ceelin plus users, too. My 4 kids are also user a CEELIN PLUS ever since they’re young, and my 11 month old baby he use also for CEELIN drops. I’d love to win this giveaway because I want to strong and healthy! The winner is surely a lucky one! I’d love to win the giveaways! I’ll give it to my little brother and cousin! My son has just finished his bottle of Vitamin C (another brand) last night, so it’s the perfect time to try Ceelin Plus. VitaPops’s unique presentation is something I’d like my son to try, too. Pick me! I’m a paranoid mom when it comes to my daughter’s health. With those vitamins, I can help keep sickness at bay. My daughters are Ceelin kids. I’d love to win this! Thanks, mommy Tetcha! And thanks to Unilab, again, for this blessing. More power to you both! ← Davao, Here We Come!